It seems I have been talking to much about the benefits of weight training over the simple steady state cardio around my family. Now, My mother wants to come and workout with me and give it a try. The problem, is, I don't really know where to to start or what I should have her do. Obviously, I'm would not want to have her do something like a Starting Strength routine, WS4SB, or even jump right into any strength based program. General conditioning and mobility, with an emphasis on heart health. Knee surgery early last year or maybe 2009, Heart Disease (This is a problem way up my family tree on both sides). My initial thoughts are along the lines of starting off with a BW and/or Barbell Complex of some type. But, I really don't know. What should I try to get her to do. I know there have been some pretty good threads about this same topic here, but haven't found them yet. Still looking though. Dumbbells are usually a little less intimidating than barbells so use those first. Concentrate on the big six movements and some core stability work. Use body weight first and assistance where needed. Stress form. keep sets low at first until she becomes conditioned. I can't get my mother into the gym yet. She'll be 80 this year. One thing to keep in mind is that *anything* done by someone new to exercise is going to yield positive results. To that end, I'd be inclined to go for whatever she finds enjoyable, safe, and comfortable. I'd aim for compound movements with dumbbells. I'd focus on form and maintaining motivation. 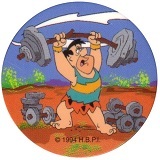 stuward wrote: Dumbbells are usually a little less intimidating than barbells so use those first. Concentrate on the big six movements and some core stability work. Use body weight first and assistance where needed. Stress form. keep sets low at first until she becomes conditioned. I can't get my mother into the gym yet. She'll be 80 this year. Truth be told, I can't get my mother into the "Gym" either. I've started working out at home and this is likely the only reason she is even considering this. We live less than a mile apart. I don't have many dumbbells yet, but do have a few that we have collected over the years. I'll have to see what I have. Step ups are good. Some people have knee trouble with lunges. Split squats are an alternative. Dumbbells don't have to be heavy. Most exercises will be with 5 & 10 lbs at first. Pick up a package of resistance bands. Most 60 year old women can't do chin ups so do pull downs with resistance bands. The best deals are on e-bay. Think first about general movement. For people like you describe, about the only thing I'll have them use any load on at first is DB rows and goblet squats. I try and go - Lower body, Upper body, Lower body, Upper body, Core. As a circuit. Repeated 3-5 times. Don't go single leg before 2 leg movements. If she can't squat, she deffinitly shouldn't lunge. Start with Goblet squats. A light DB held at the chest often makes the squat look better than using no weight at all. If squatting is a problem, go with DB Sumo DL's. I've yet to come across someone who can't do them, and they teach the person to "hip hinge" perfectly, as well as spread the knees apart. The key is to make it all hips, and as little "knee" as possible (they shouldn't move forward much if at all). If she can squat and lunge, you're laughing. It would just be a case of, for example - Goblet squats -> DB Rows-> Static Lunge-> Elevated Push ups-> Planks... There you have a circuit. Half the value in it is that they get plenty of practice at some of the fundamental movements whilst at the same time, get out of breath, which is all they need at first. It'll get too easy or too boring quickly (both are as bad as each other! ), but by that time you can progress and use more movements and a different set up. Should take 15-20 mins, and you can finish off with some traditional cardio (anything from a brisk walk, to intervals on a bike, etc....almost anyone can smash a med ball off a floor, and almost everyone loves doing it). An example, if she can't squat, is to switch goblets for DB Sumo DL's. Switch lunges for low box step ups with knee lift.... If I can't have someone do elevated pushups I'll have them do DB floor press. Although I've probably over complicated it, the main points are - Keep it simple and basic, don't do anything that hurts, strive to improve movement (perfect form). I generally go to step ups as the first single leg movement people will do. However, a lot of people butcher them on the way down - the knee will cave in and/or they land with a big thud. The more they control it, the more the knee caves in. Can turn into a losing battle. This is when i'll regress to low box step up with a knee lift. I'll progress to a full step up before static lunges/split squats. I second the bands - they're very handy! You can row/pull down, and you have loads of Pallof press variations available to you, aswell. Keep us updated of her results, I'm really interested. Here is another place for "box squats". Start from a box. Having her sit on a box, or a solid wooden chair that puts her at about parallel gives you a chance to help her get her feet and knees into good position, and to check that she can keep a neutral spine at that depth. She'll need to be near the edge of the box and lean forward to get her weight over her heels, but she won't actually have to try to take it up until everything is in good position. Standing in front of her hand holding her hands on the first few reps can help her keep in balance, and make it a bit easier to stand up. Here is some stuff to keep in mind, from someone who trains 60-year old novices. - start right off with "do not work through pain." Some people will. Discomfort is fine, pain is not. - assess as you go. Try a squat. Pay attention to knee cave, rounding of the spine, and any side-to-side hip unevenness (does one hip drop lower than the other?). - unlike KPj, I'd use single leg before two leg lower body exercises. I'd start with step-ups, I'd try a lunge (if she can lunge, she can squat. If not, find out now). Everybody walks up stairs; get her doing it correctly without knee caving or ankle wobbling or bending forward under any load. Work up to goblet squats and zercher squats (use a sandbag - it simulates carrying a bag while moving), and use box squats to ensure she only goes as deep as her flexibility and movement limitations let her. "Quarter squats" are not acceptable for young athletes; they are often exactly what you need for a 60-year old with knee, hip, and back pain. - keep everything "corrective." Form is key, not weight. She's 60, she's probably not looking to compete with Louie Simmons. But I'm sure something hurts; make sure everything is technically perfect and increase loads very gradually. - teach movement strategies - one-legged deadlifts are great ways to pick something off the floor without back flexion. Driving the heels into the floor is a great way to stand up without rocking forward excessively. Getting up and walking around every 10-15 minutes is a great way to avoid back pain from sitting too long. - put weights used in terms of groceries, kids, ability to grab and hold something when you slip, etc. 60-year old women tend to be underwhelmed by hypertrophy and 1-rep maxes. They do like to be able to pick up that 10-pound bag of dog food from the bottom shelf without pain. - Farmer's walks are incredibly useful. Load up a gym back or two and have her do a series of short walks. AKA, carrying stuff in real life! Anyway, just some tips from me. Hope they're useful. This is all some great information. Keep it coming.. I'll definitely keep everyone updated on how it all turns out. Gosh, Peter. Keep going. Or just write a book. I expect that by about chapter 3 you'll be at my level of training. That's great stuff. KPj and Peter--I'd like to see a debate on the single-leg first vs. full-squat first issue. Isn't 3 posts in a row against Ironman's rule? Sorry. This is tangentially related to the above. I have had some discussion with Jason about training older people who have osteoporosis, and this is relevant to that discussion, too. If anyone trains older clients (or mother) they should be aware of all the clients' medical conditions, and be knowledgeable as to exercise implications for those conditions, in a general way (no, I don't expect you to go to medical school). Obviously, clients should have medical clearance to train. Here is a link to the site of The Center for Strong Medicine (I love that name), in Sydney Australia. The link is to a page of links to articles on osteoporosis, and one general article about exercise in the treatment of medical illness. In another part of the site it has this statement: "The frailer the patient the better. Frailty is not a contraindication to exercise, but rather one of the most important reasons to prescribe it." I love their attitude. Jungledoc wrote: KPj and Peter--I'd like to see a debate on the single-leg first vs. full-squat first issue. -Like step ups/stairs, everyone already squats, and most do so badly. Everyone already deadlifts, and most do so badly. I'm taking something they already do, and improving how they do it. -I'm a big believer in having "the ability" to nail a below parallel squat. This is probably a post in itself. However, the squat is probably the most fundamental of all movements. I won't necessarily TRAIN the squat, but i'll always train the "ability" to squat. I often tell people this, since i'm known in my gym for my love affair with bilateral squats and DL's - I actually have a regular client who doesn't "train" either, but she can "do" both. In order to have the ability to do them, we had to train them, but as soon as she had the ability, we went all single leg. I think the biggest issue is "what's the best way to get people good on one leg?". Do we try and start on one leg, or do you start on 2? I start on 2. First, though, I find it interesting on where to "start" with single leg. I've changed opinion various times. Mike Robertson says Step ups. Mike Boyle says split squats. How can you question either? I've found that you can get people to do step ups straight away, so it seems natural to start here. At the very least, they're there to create a training effect. However, when it comes to progressing to lunge variations, I find most people struggle most with the eccentric phase. Getting back up is essentially very similar to a step up. Getting down is significantly different, and I find that step ups don't prepare you very well for this, since there's pretty much no eccentric phase, which is why almost anyone can do them. Therefore, whilst i tend use some kind of step up from the start, I don't consider them a good progression to lunges and other single leg movements. I've also just had lots of people who can step up pretty well, yet struggle like hell to b/w lunge. However, i've not had anyone that couldn't do 15-20 good form, below parallel b/w squats, who I couldn't coach into a decent, pain free lunge. So, with my own experience so far (note - not much), i've swayed towards the Boyle way of thinking - Develop strength on 2 legs, then move to 1, and start with split squats. Above all else, I find it makes life more "simple". I don't really think much/any of this will be a counter point as such, probably just 2 different roads to the same destination.